Comic-Con Guide: Is SDCC going back to basics? Is SDCC going back to basics? If you've been around San Diego Comic-Con long enough, you probably remember the days when attendees showed up for the Exhibit Hall back issues and action figures, the D&D meetups, the chance to sit in the same room with Neil Gaiman. And you probably observed with some bemusement as the periphery of the convention center mutated into a 12-ring marketing circus, with offsite lines that rivaled any day for Hall H.
Today it's not uncommon for attendees to buy badges and show up in San Diego without ever setting foot in the convention center. They may camp for Hall H to see their favorite celebrities but mostly they're hunting the other big game: the various HBO and Netflix and AMC attractions, the network-hosted parties and offsites, premieres and screenings, any watering hole where a drunken celebrity might agree to a photo. But in recent years, studios and other companies have noticed that the ROI of SDCC is more fable than reality. Remember this Hall H infographic? Or when Forbes gently corrected the perception that SDCC outranked the Oscars? Various companies have tested the investment waters with offsites, swag and events; sometimes it works out for them but often it doesn't. I can't even count the number of networks and studios that have crowned themselves "Your Comic-Con Headquarters/Destination/Source!" and then failed to show up the following year. Even HBO isn't showing up this year. And this fade has demonstrated itself in other ways, like how so many TV panels now hand out cheap plastic trinkets instead of the t-shirts we used to get or how swag bags get lighter and lighter - even though you've just handed over your personal data at the booth to get them. In the last 2-3 years, people have complained most vociferously about the lack of good events. For a while it seemed every night offered a glut of comedy shows, cosplay contests, VIP parties, concerts, fetish and goth balls and other offerings. Now - not so much. Nerd HQ can't afford to make it happen (though they obviously want to) and now SyFy Live isn't happening either. Neither is W00tstock or Heroes Brewfest. We've had a few parties announced like the Ready Player One at FLUXX and Impractical Jokers but on the whole, the schedule feels light for only a month out. If you're feeling a little bereft about your San Diego social plans this year, I'd ask you to remember that there's still a lot going on. I know the big flashy parties get the most social media love and in some ways, they've come to define SDCC for many attendees. But there's so much else going on. We have film festivals and horror movies and anime screenings to go to. There are gaming tournaments and demos galore. We're still waiting to hear about the official Con offsites. Cosplayers excel at setting their own photo shoots and parties and it's a welcoming community for beginners. SDCC has increased its nighttime programming - trivia contests, panels, screenings - and clubs around the city will host everything from contests to nerd nites to live art shows. You can spend more time with your friends just getting drinks. And you can always plan your own happy hour, meetup, bar crawl or party. Finally - radical thought - you can always take in more of the actual Con. If you don't typically use your badge much, take advantage of it this year and pick up a new hobby, whether it's anime or comics or sci-fi or virtual reality or something else. Maybe that's not as exciting to you as Conversations for a Cause but it's still a good way to meet people and expand your social network. 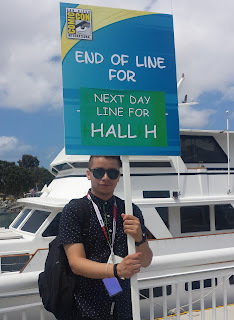 Ultimately you have to architect your own Comic-Con fun. It's possible the glow of SDCC's nightlife halo will continue to diminish. But I doubt it will disappear altogether. More events will be announced over the next month and you will find something to do. I just don't know its worth it. The travel, the plane tickets, the hotel room. We may decide to spend our dollars elsewhere. I suspect a lot of people would make it an every other year, or every 3 years thing, if the badge sales didn't favor recent attendees. A lot of my friends have said that CC has changed a lot especially these past few years. The nightlife like the bars and hotel events, I feel, don't attract the regular people like me. The wonderful think about CC is that all sort of people come and not those just to party and hook up. So I hope CC will go back to basics. I don't need the flash; I'd like the way it used to be. But then I don't know if there will be noticeable change. I will go this year but I question myself if I will go next year. If it's the same thing year after year, and assuming I can get in at all, there isn't a reason to go at all. I don't need the flash either. I miss the milder days.